Maqamat Al-Hariri are frequently referenced on beautiful pictorial illustrations showcasing aspects of life from the Golden Age of Muslim civilisation. But what were the Maqamat? A Maqam (plural: Maqamat) is an Arabic rhymed prose literary form with short poetic passages. * The Maqamat, written in a sophisticated rythm, were primarily aimed at educated audience and left us with an excellent showcase of pictorial traditions of the period. According to Alain F George "The text is a masterpiece of Arabic literature". On the second half of the tenth century, a new literary genre appeared. This was known as maqamat "assemblies" - amusing anecdotes narrated by a vagabond who made his living by his wits. The maqamat were invented by Badi' al-Zaman al-Hamadhani (d.1008); only fifty-two of his original four hundred maqamat have survived. Al-Hariri (d. 1122) elaborated upon this genre and stereotyped it, using the same format and inventing his own narrator and roguish hero. The popularity of the maqamat was only eclipsed by the rise of modern Arabic." Al-Hariri’s Maqamat consist of a series of tales that relate to the adventures of a rogue fictitious character by the name of Abu Zayd of Saruj* who wanders the world armed with his mastery of the Arabic language deceiving those he encounters to earn some rewards. The stories, under this disguise, often discuss serious topics. The Maqamat presents a vivid street-level view of the medieval Islamic countries at the height of their power and culture. We meet merchants, clerics, peasants, sultans, and scholars……. We get to visit fabled cities of Iraq, Iran, Arabia, Yemen, and other middle eastern locations. Some of these will be familiar from the headlines: Mosul, Basra, Samara, and Baghdad." Let us marvel at some of the beautiful illustrations found in a 13th century copy of Maqamat Al-Hariri. Figure 2. Miniature from one of the greatest Arabic illuminated manuscripts, a compendium of tales by al-Hariri of Basra (446-516 A.H. / 1054-1122) illustrated by Yahya ibn Mahmud al-Wasiti: The Maqamat (Assemblies). Paris, Bibl. Nat., MS arabe 5847 (Source). 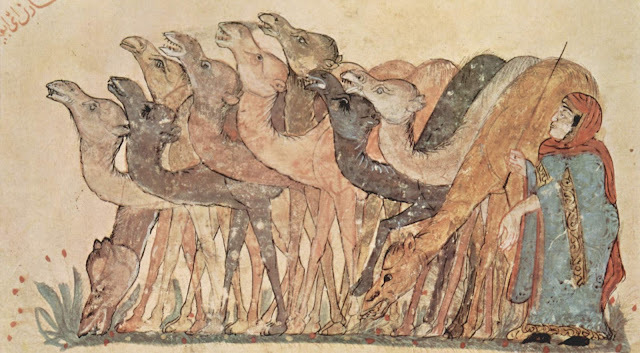 Annotation for above image (Figure 9): "The image by 13th–century illustrator al-Wasiti is from the Maqamat (Assemblies), a collection of stories of a picaresque hero. 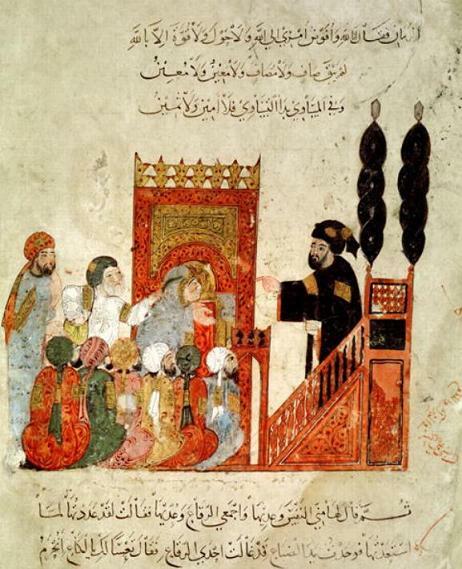 The author, al-Hariri (1054-1122 CE), is an important figure in Arabic literary history. The illustrations belong to the Baghdad School of miniature illustration, and depict scenes of ordinary life. The scene illustrates aspects of a village life. Al-Wasiti used a composition technique in which multiple levels show different planes of the scene, allowing him to compress many aspects of village life into the small space of the painting. A date palm, the village mosque, and the individual brick or adobe houses line the village street. Al-Wasiti portrayed the intimacy of life in the village, with each door open to show the family dynamics and work being done. A girl stands in one doorway with a woman, probably her mother. A woman in another doorway appears to call to someone, while a husband and wife nearby converse or argue. Poultry roost on the roofs of houses, a woman spins thread, and people tend domestic animals, including sheep, goats and water buffalo, often the work of women and children." "Bayt al-Hikma (House of Wisdom) is a semi-private centre supporting research in the arts and humanities. It was completely burned and looted. It is located right next to the Ministry of Defence, on the site of a 13th-century madrasa (school). Its collection was relatively small, holding only about 100 manuscripts. But they included a 9th-century Qur'ān, a 12th-century copy of the Maqāmāt of al-Harīrī, an Ibn Sīnā philosophy text, and a 19th-century manuscript of al-Alūsī concerning Baghdad. This entire collection was lost – and there were no microfilms or microfiche copies. It is unclear whether they were stolen or burnt." "Venetians built the first church, a precursor to the present 11th-century basilica, to house the saint's relics. Inside the basilica's atrium, Biblical mosaics with scenes of banquets, bedside miracles and camels traversing deserts were modelled on similar scenes in illustrated Arabic texts such as al-Hariri's Maqamat and the Persian epic, the Shahnama, according to Cambridge University architectural historian Deborah Howard." "Aside, then, from this or that archaeologically or historically significant detail provided by the miniatures, the major significance of the Maqamat to the historian is that its existence reveals one unusual facet of the complex world of the city in the Arab world of the Near East: its interest in and involvement in images for the sake of images even more than as an illustration of life. That, at the same time, a limited but definable vision of the world seen by a precise group in the city does emerge is due to the character of the book rather than to the character of the men who had it illustrated. All that they expected was a literarily faithful, imaginative and meaningful visual translation of their favorite text and thus an appropriate status symbol for their position." 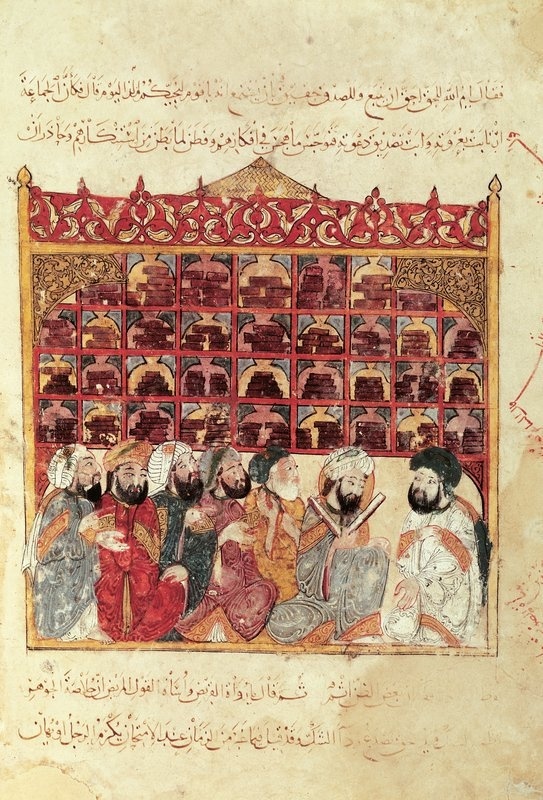 The Maqāmāt of al-Hariri (d. 1122) appear to have been among the most frequently illustrated works of this era and in many ways represent the peak of this pictorial tradition The text is a masterpiece of Arabic literature, consisting of fifty episodes that relate the adventures of their rogue hero, Abu Zayd of Saruj, at the four corners of the Islamic world. "In this striving after an ornate and elevated style the adoption of a species of composition, that had raised pulpit oratory above the language of every-day life, seems to be a natural result, and thus rhymed prose became the essential feature not only of official writing, but also of the private correspondence of the learned and the cultured. It will be sufficient to mention three collections of such Epistles: those of Abú’l ‘Alá al-Mu‘arrí (A.H. 363-449), edited and translated into English by Professor D. S. Margoliouth; extracts from those of Abú Bakr al-Khwárazmí cited by Tha‘álibí; and those of al-Hamadhání himself, edited and published with notes by Ibráhím Ibn ‘Alí al-Aḥdab (Beyrút). It was Hamadhání, however, a master of the epistolary art himself, who conceived the idea of demonstrating in a series of dramatic discourses, known to us as the Maqámát, how the use of this mode of composition might be extended to literature so as to include the entire range of the life and language of the Arabian people. He was, therefore, the popularizer of rhymed prose, in a class of compositions with which his name was first associated, and which have not only penetrated all Islámic literature as well as that of the Syrian Christians, and the Spanish Jews, but have served as models of style for more than nine hundred years." Figure 10. The Maqámát of Badí‘ Al-Zamán Al-Hamadhání, Translated from the Arabic, with an introduction and notes, historical and grammatical, by W. J. Prendergast, Bḷitt. (Oxon.) (Source).